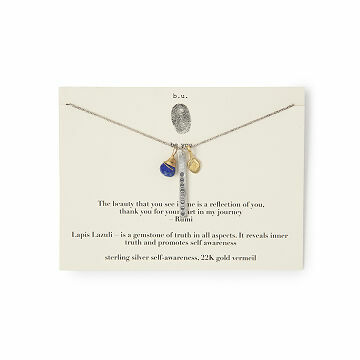 With lapis and charms designed to represent a journey, this necklace symbolizes the warmth of support. Mary Steratore's meaningful piece comes with a quote from the 13th century Persian poet and Sufi master, Rumi: "The beauty you see in me is a reflection of you, thank you for your part in my journey." The necklace serves as an embodiment of that sentiment. Lapis stone—here, wrapped in wire and attached to a sterling silver chain—represents truth in all aspects of life, while the sterling silver moon phase and gold vermeil charms both indicate the undertaking of a journey. The symbolism combines to make this the perfect present to express gratitude to anyone who has helped you along your way. Handmade in Pennsylvania. This was a retirement gift for our supervisor of 28 years, who was integral in the career development of staff. The woman recipient helped me through my grief journey after my wife of 31 years passed away. She likes jewelry, so this was the perfect. My mom loves it and has already worn it twice and I've heard no complaints so I think it's great. I really like the sentimental meaning behind the necklace but it wasn't what I was hoping for looks wise when I received it. All around I just loved it! The phases of the moon charm on the necklace was very detailed in craftsmanship. The chain was the perfect length. It does tangle easily, but if you take care of it the way it's meant to be, it will not tangle. I am so happy I can give this as a Christmas gift to my dear friend. It is beautifully crafted and I love the gold fleck on it!